Europe's top antitrust authority is on the lookout for companies using big data to stifle competition, although it hasn't spotted any problems yet, according to Competition Commissioner Margrethe Vestager. It's good news when companies use data to cut costs and offer better service, the European Commission's competition chief said at the DLD conference in Munich on Sunday. "But if just a few companies control the data you need to satisfy customers and cut costs, that could give them the power to drive their rivals out of the market. And with less competition, there's a risk that there won't be enough incentive for companies to keep using big data to serve customers better," she said. The issue came up in two merger cases, Vestager said: Google's 2007 purchase of DoubleClick and Facebook's acquisition of WhatsApp two years ago. But despite Google's size and the insight that DoubleClick gave it into the effectiveness and reach of banner advertising, "In the particular circumstances of those cases there was no serious cause for concern, because even after those mergers other companies would have access to many sources of useful data," she said. While the Commission hasn't opposed Google's acquisitions, it has objected to the way the company promotes its own services in search results, and is investigating the way it bundles its own services and apps with its Android operating system. Control over data doesn't just allow companies to squeeze existing rivals out: It can also allow them to block new entrants. 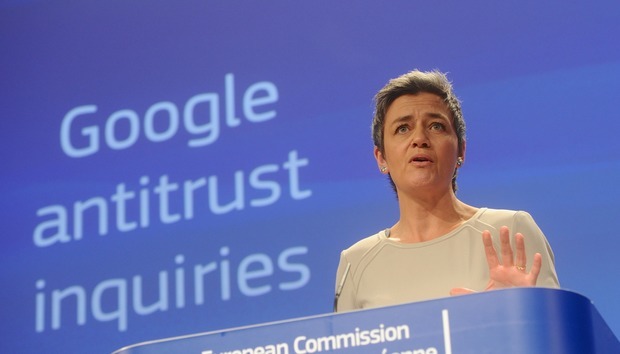 "We have to make sure new ideas have a fair chance," Vestager said. "Powerful companies mustn't abuse their power to stop new ideas having a chance of success." Big data is a corporate asset like any other, though, and shouldn't require special antitrust regulation. "We don't need a whole new competition rulebook for the big data world. Just as we didn't need one for a world of fax machines, or credit cards, or personal computers," Vestager said. Likewise, she said, the Commission isn't going to intervene just because a business is based on data. "If a company’s use of data is so bad for competition that it outweighs the benefits, we may have to step in to restore a level playing field. But we shouldn’t take action just because a company holds a lot of data. After all, data doesn't automatically equal power," she said. Companies such as Google and Facebook are able to compile their vast collections of data about us because we give it to them, using it as currency to pay for an otherwise free service. But, said Vestager, "This new currency brings its own challenges. It isn't always easy to know what it’s worth. The exchange rate between data and services isn't reported on the news, so it can be hard to decide how much data to give up." Once consumers have paid the price for these free services, they start to worry about what companies will do with their personal data, and whether they will take good care of it. Barely a quarter of people trust online businesses to protect their personal information, Vestager said, but she dismissed suggestions that market forces could, or should, fix this. "I don't think we need to look to competition enforcement to fix privacy problems," she said, pointing to the Commission's recent rewriting of data protection law as the solution. But, she said, "That doesn't mean I will ignore genuine competition issues just because they have a link to data."